Interpreting Indian culture to an American audience is a challenge, but Shah Rukh Khan is so important to global art and social activism, I will attempt to do just that. The largest Bollywood actor and producer, he is a major, global entertainment figure who cares deeply about creativity and humanity. For this reason, Yale University presented him this week with its Chubb Fellow Award, its most prestigious award for leadership, given previously to Walter Cronkite, Jimmy Carter and Bill Clinton. In 2011, The Los Angeles Times noted, "He is the biggest movie star you've never heard of. And perhaps the world's biggest movie star, period." He is all of that and more. 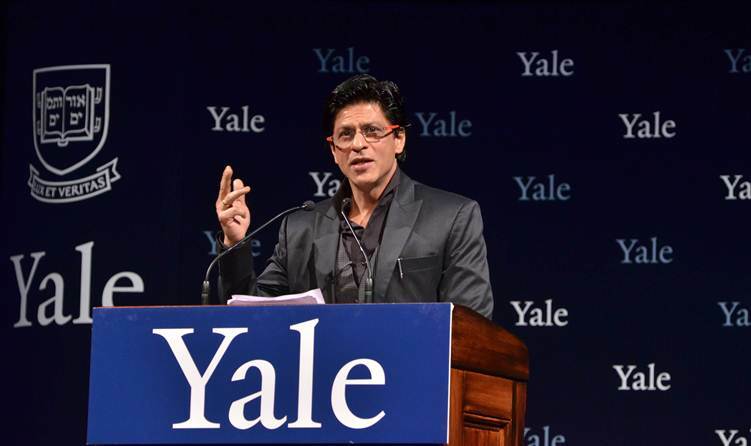 Shah Rukh Khan addressing the Yale community as Chubb Fellow. Yale University / Michael Marsland. American entertainment figures who might come close to him include Madonna and Lady Gaga, although neither of our stars can touch the output or contributions that Shah Rukh has made to India and the world. Paul Newman with his foundation also comes to mind. Shah Rukh has an estimated fan following in literally the billions. With a "B." It is estimated that one-third of the world's population knows of him. In New Haven's Schubert Theater, the frenzy around him -- almost religious -- reminded me of past concerts with Elvis or the Beatles. Yet the majority of 1,700 fans were South Asian. Newsweek named him one of the fifty most powerful people in the world four years ago; in 2004, Time had featured him in their list of "Asian Heroes" under the age of 40. Today, Bollywood itself has surpassed Hollywood around the world and is now headed to the U.S.
Shah Rukh Khan, informally referred to as "SRK," Shah Rukh has acted in over seventy Hindi films. One billion U.S. dollars have been made by just eleven of his films. After graduating with a Bachelor's degree in economics, he started his career appearing in theatre and several television serials in the late 1980s. Deeply absorbed with goodness, ironically he is best known for his unconventional choice of negative roles in films such as Darr (1993), Baazigar (1993), and Anjaam (1994). Shah Rukh also owns a cricket team in India. SRK faced the press after arriving late after being delayed, as usual, by U.S. immigration. Photo: John Lee of The Stewardship Report. SRK was born in 1965. Although India has a Hindu majority, he is a Muslim -- married to a Hindu woman, Gauri Chibber, in a traditional Hindu wedding ceremony. At home, his children follow both religions, with the Qur'an placed next to the Hindu deities. He spoke of his children frequently. Activism is in his genes, as his father was an Indian independence activist prior to Indian independence from the British in 1947. His distant roots are in Afghanistan. America still struggles with Islam: last year Shah Rukh was outrageously detained by our own immigration when he arrived through Newark. His press-conference and presentation was delayed for hours as, although he flew on a private jet from Mumbai to New Haven, U.S. immigration detained him in customs once again. He joked, "Whenever I begin to feel arrogant about myself, I take a trip to America!" 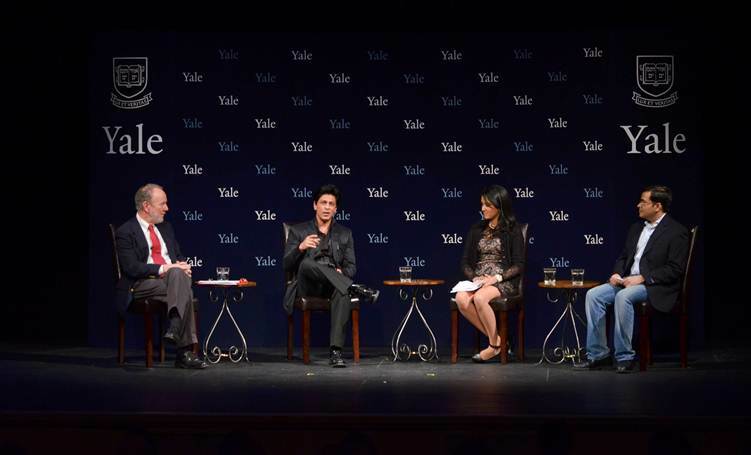 SRK in panel with Yale Master Jeffrey Brenzel and Yale students. Photo: Yale University/Michael Marsland. Shah Rukh was very attached to his parents as a child and describes their death at such a young age as a turning point in his life. His father lost his battle with cancer when Khan was 15 years old and his mother also passed away after a long illness. He says his biggest motivation for working hard is to make movies "so damn bloody big... that my parents somewhere sit down on a star and say 'I can see his movies from here better than I can see the Wall of China or anything!'" He spoke repeatedly from the stage about his parents and the need for Yale students to honor theirs. "Love your parents. Cherish them." Yale's Chubb Fellow Award has been given to Walter Cronkite, Jimmy Carter and Bill Clinton. Shah Rukh works very hard, sleeping only 4-5 hours a night, but never brags about his good works. Known for not talking about his humanitarian work, he helped create the children's ward at the Nanavati hospital in Mumbai. He contributes regularly to organizations and individuals, especially in the case of AIDS and cancer patients. He has also lent his name to various government campaigns throughout the years, notably those of Pulse Polio immunization campaign. He is a member of the board of directors of Make-A-Wish Foundation in India. He told the audience, "I want to increase education for women, provide toilets -- simple things." He dislikes gossip columnists. "The gossip and nonsense is so strange and make you feel weird -- I just want to do good stuff." "I don't like relaxing at all," he said, "and I am a disbeliever of holidays and taking times off." "I wish to give the creative part of me away, it's not about how many Rupees I give." But he gives generously. A few years ago, Shah Rukh adopted five entire villages outside Delhi, providing solar electricity through a program known as 'Light A Billion Lives.' The following year he adopted eight more villages -- and then again eleven more. That's a lot of light. 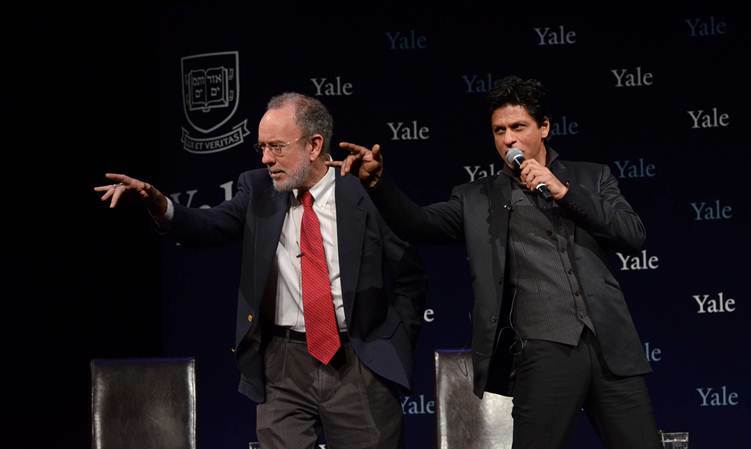 SRK ended his presentation by dancing with Yale student on Chammak Challo tune. Recently this Bollywood legend visited two Kashmiri orphan children who suffered severe burns during a terrorist grenade attack in India and agreed to bear their medical expenses. In 2011 he was honored with the UNESCO's Pyramide con Marni award for his charity engagements and social commitment towards providing education for children, becoming the first Indian to win the accolade. He told us how much he hated racial profiling, bigotry and sexism. As a Muslim performer, he has united not only India with its hundred languages and faiths, but people of all languages and faiths across the globe. Back to his film career: in 1998, he won critical praise for his performance in Indian director Mani Ratnam's critically acclaimed Dil Se... I interviewed Mani on film two years ago (video). In 2001 he played the role of Emperor Asoka in Santosh Sivan's historical epic, Asoka, a partly fictionalized account of the life of Ashoka the Great whom I chronicled during my pilgrimage to Buddhist holy sites in India this January. Asoka was released coincidentally on 9/11 and played across the U.K. and in North America. Continuously challenged while "traveling while Muslim," Shah Rukh was stuck in New York while promoting this film right after the September 11th attacks. 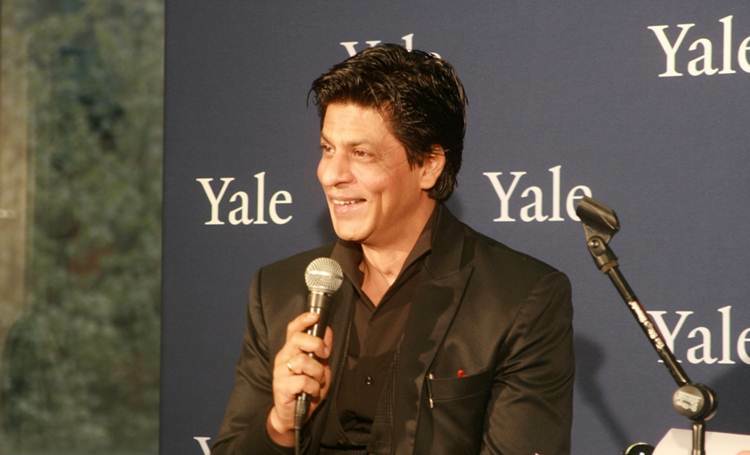 SRK with Yale Master Jeffrey Brenzel reciting Don II dialogue. Photo: Yale University / Michael Marsland. In 2009, while in Los Angeles, he took a break from filming to attend the 66th Golden Globe Awards in L.A. where he was introduced as the 'King of Bollywood.' Shah Rukh was then introduced with Freida Pinto of Slumdog Millionaire, a movie he had previously turned down. My Name Is Khan is one of my personal favorites. Released in 2010 in cooperation with Fox, My Name is based on a true story, dealing with post 9/11 Islamaphobia. His film became the highest-grossing Bollywood film of all-time in the overseas market up until then. I love his line, "My name is Khan -- and I am not a terrorist." Being harassed by U.S. immigration seems to be SRK's lietmotif. He told the Yale audience that our immigration service wears him down with silly questions. He imagined being asked his race so that he could reply, "white." I cannot commend my father's alma mater, Yale University, for being the first American university to honor this man. Shah Rukh Khan is a thought leader and global citizen of the highest magnitude. 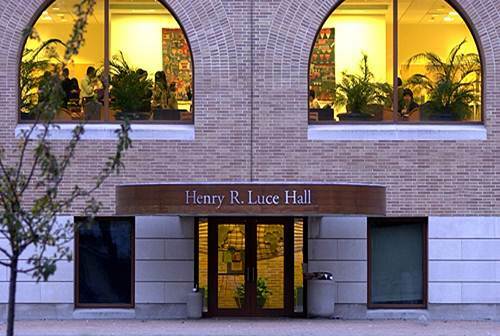 Yale's Henry R. Luce Hall for International and Area Studies. Photo: Yale University / Michael Marsland. The Chubb Fellowship is devoted to encouraging and aiding Yale students in the oppression of government and in public service. Established in 1936, through the generosity of Henron Chubb (Yale 1895), the program is based in Timothy Dwight College, one of Yale's residential colleges. Each year three or four distinguished men and women have been appointed as visiting Chubb Fellows. Special thanks to John Lee and Zoran Saher who traveled to Yale with me and helped this American more fully understand the persona and phenomenon I was witnessing. Follow Jim Luce on Twitter, Facebook and LinkedIn.